Along with LIC New Jeevan Nidhi , LIC has launched ULIP plan called as Flexi Plus. LIC’s Flexi Plus is a unit linked assurance plan, which not only provides a lump sum benefit on death but also the maturity benefit irrespective of the survival of the Policyholder. 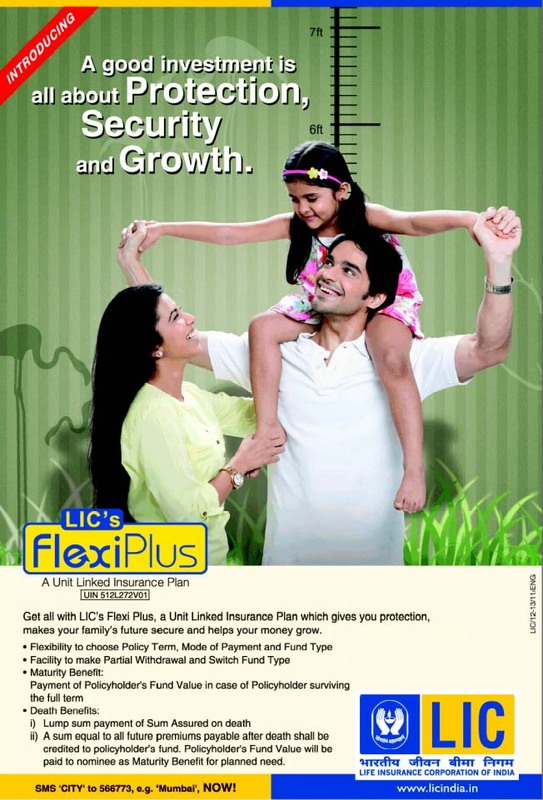 Let’s Review LIC Flexi Plus. On Surrender of the policy, Policyholder’s Fund Value is payable. An amount equal to sum of all future premiums payable after the date of death shall be credited to the Policyholder’s Fund. On the Date of Maturity an amount equal to the Policyholder’s Fund Value will be given to the nominee/legal heir. On Life Assured surviving the date of maturity, an amount equal to the Policyholder’s Fund Value is payable. Debt Fund – This fund purely invests in debt funds and is suited for low risk profile. Mixed Fund – This would have maximum of 25% equity investment and rest in debt instruments. This fund selection will bring more reward. The Debt Fund option above is similar to Debt Gilt and Long Term Mutual Fund. If we look at 10 years return of funds from this category. Return value varies from 3% to8 %. One can expect similar return from LIC Flexi Plus – Debt Fund. Mixed Fund option is similar to Hybrid: Debt-oriented Conservative Mutual Fund. Past performance of this fund varies from 7% to 14%. This is the percentage of the premium deducted towards charges from the premium received. First year it will be 7.5%. For 2-5 Year it will be 5% and then onwards 3%. This is the cost of life cover, which includes payment of Sum Assured and all future premiums payable under the plan. This charge shall depend upon the Sum at Risk i.e. sum of Sum Assured and total amount of all future premiums payable under the policy as on the date of deduction of mortality charge. This charge shall be deducted on monthly basis by cancelling appropriate number of units out of the Policyholder’s Fund Value. This is a charge levied as a percentage of the value 0.50% p.a. of Unit Fund for “Debt” Fund & 0.60% p.a. of Unit Fund for “Mixed” Fund. A service tax charge, if any, will be as per the service tax laws and rate of service tax as applicable from time to time. This is a charge levied for an alteration within the contract, such as change in premium mode to higher frequency, and shall be a flat amount of Rs. 50/-. LIC Flexi Plus is good for Investment? LIC Flexi Plus is a ULIP which plan to invest in debt and equity related instruments. This is similar type of investment pattern which most of debt related mutual funds follows. Important criterion in selection of mutual funds is additional expense which can be measured by expense ratio. Expense ratio in case of debt related mutual funds is in range of 2% to 2.25%.In case of LIC Flexi Plan expense ratio is slightly higher than this. As discussed earlier debt fund selection will be kind of purchasing Debt Gilt and Long Term Mutual Fund expected return will be 3 to 8% per annum. Mix fund selection will be kind of purchasing Hybrid: Debt-oriented Conservative Mutual Fund which has given 7% – 14% annualized return over a long period of ten years. If you are insured adequately no need to purchase this plan. If you are planning to invest in debt based mutual fund than you may consider LIC Flexi plus as option to that but remember additional expense for this policy is higher.